Super Sunday is going to be a little warmer than we thought. It’s projected to be in the 40s at kickoff and we should have full dimensional football. Has there been a Super Bowl in the last 10 years that had this much anticipation before the game? ?One way or the other we will have history made tomorrow night. If Denver wins, Peyton Manning will the first quarterback in 54 years to win championships with two teams. If Seattle wins, his defense will go down as one of the all time great units and the first to do so because of their back 7. Along with Percy Harvin, Moreno is an X factor. Even more so, he is the key to a Denver win. 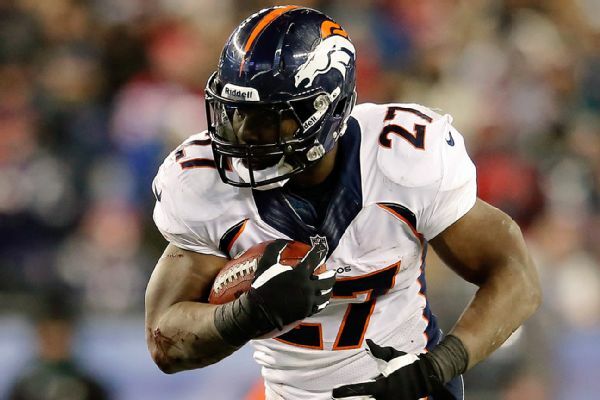 The key to the marquee match-up between Denver’s offense and Seattle’s defense is Knowshon Moreno. If he can get yardage from the outset, it will allow Manning to throw when he wants to. Not when he has to. The Broncos let it get out they may not sign him as a free agent. He may use this game as a showcase of his skill and give the Seahawks fits. Remember he is from New Jersey so watch how emotional he’ll start this game. Marshawn Lynch is the key to Seattle winning this game. 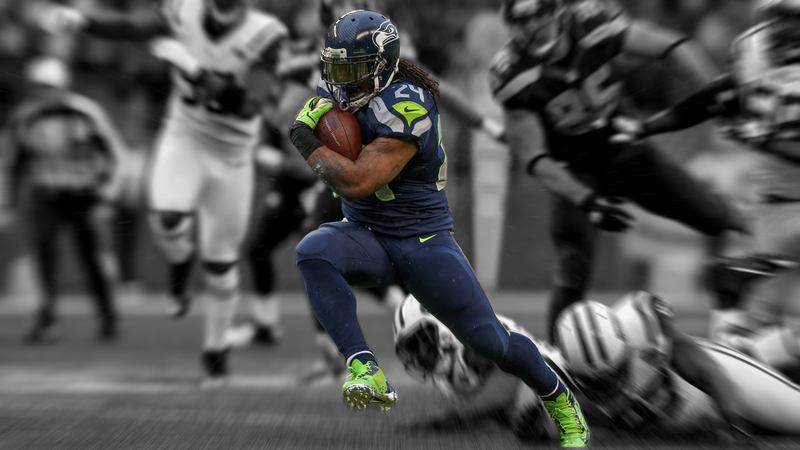 Marshawn Lynch needs to keep his string of 100 yard games going in this one. Or at least he has to keep his number of rushing attempts up. The Seahawks have to have balance to keep their offense going. Their receiving corps can get open when Champ Bailey and Dominique Rogers Cromartie have to worry about the run. These guys sneak open and Percy Harvin gets to return kicks and get open. In big games your weaknesses are exposed and no Von Miller will show up today. A mush rush will not get to Russell Wilson. His quickness will get him outside where he can run and throw. Denver needs to blitz Wilson and force him to stay in the pocket and throw against their pedestrian secondary. They have to take that risk. Now here comes the #1 defense and if they win tonight, one that goes down in history. Not because they’re Super Bowl champions. Because they are one of the fastest and intimidating defenses dating back to the 1985 Chicago Bears & 2000 Baltimore Ravens. They aren’t ranked #1 overall because they are good in certain aspects of the game. 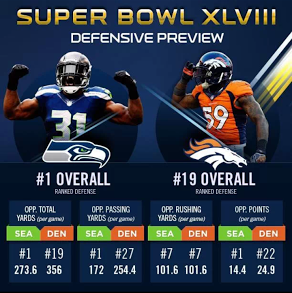 Seattle is #1 in four defensive categories. Tops in total yards, opponents passing yards, total points given up, and total turnovers at 39. No team has done that since the 1985 Bears. 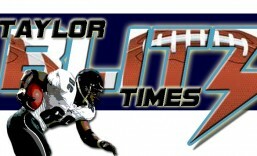 Now lets add in the fact they led the NFL in interceptions as well at 28 and what are the factors?? For one, take a look at the size of this secondary. Taylor Blitz Times Defensive Player of the Year Richard Sherman stands 6’3, Cam Chancellor is 6’3 232 lbs, and the best FS in Earl Thomas, and Byron Maxwell is 6’3 and 200 lbs at the corner makes them more physical than other secondaries. Head Coach Pete Carroll is a former defensive backfield coach and these guys are just that….well coached and fundamentally sound. 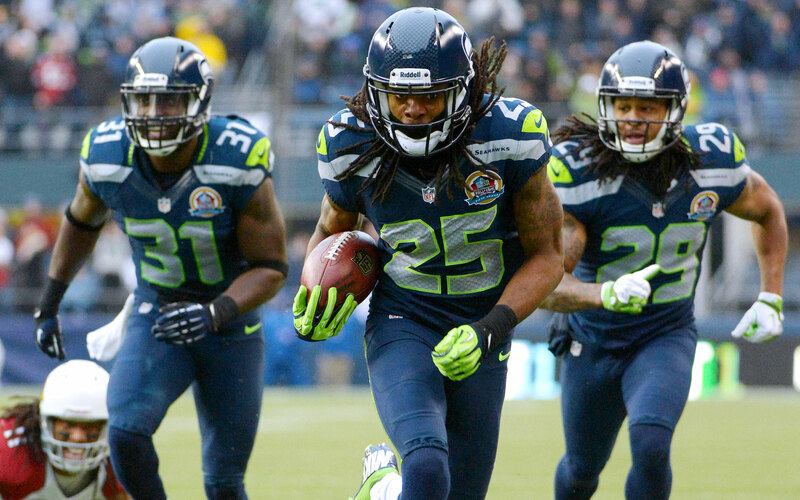 The Legion of Boom will go down in history as the best defense of the new millenium. They muscle receivers at the line of scrimmage. Keep this in mind because of Manning’s 55 touchdowns 41 were from 10 yards or less. They key is to disrupt the short timing of Denver’s offense because they can’t and don’t get deep. Keep in mind the top side of this defense is the 3 Defensive End alignment they throw at opponents. On the left side of the formation they put free agent signees Michael Bennett #72 and Cliff Avril #56 to rush the face of the passer. They use this to make the quarterback pull the ball down as the corners are pressuring receivers. Why can’t the opponent slide the line from an offensive standpoint?? End Chris Clemons, who missed last year’s playoff loss to Atlanta, is on the other side. These three combined for 22 sacks and 11 forced fumbles. Then throw in spy and delayed blitzer Bruce Irvin #51, and the Broncos haven’t seen a defense this solid, physical, and fast all year. Peyton Manning has to best the #1 defense to get his second championship with a second team. 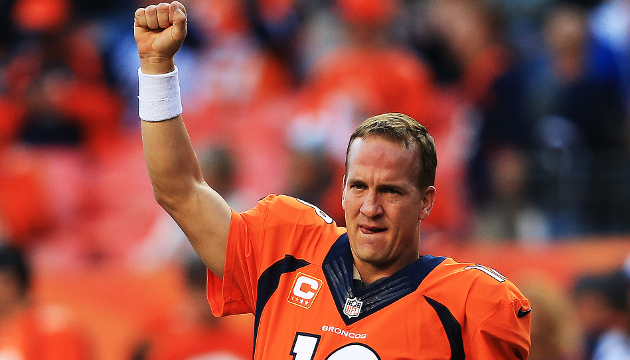 Peyton Manning is on the verge of history and needs one more game to solidify his legacy. Last night he was named MVP after his record setting season. 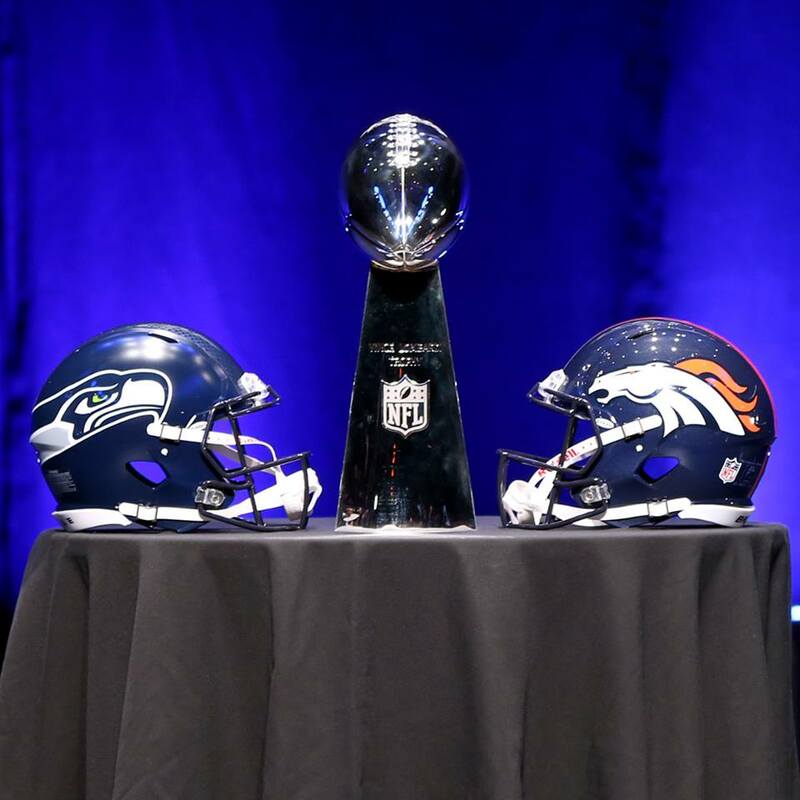 So what gives when it’s time to pick the winner of Super Bowl XLVIII. Defense wins championships doesn’t it?? When was the last time a #1 defense has lost a Super Bowl?? None we can remember. In the six times Super Bowl opponents met in the pre-season, the winner of that game is 5-1 in the big game. Of the five times the #1 ranked defense in points allowed played the #1 scoring offense, the defense has won 4 of 5 times. This entry was posted in 2013 Post Season and tagged football, Legion of Boom, Marshawn Lynch, Peyton Manning, Richard Sherman, Russell Wilson, Seattle Seahawks v Denver Broncos, sports, Super Bowl XLVIII. Bookmark the permalink. I see you have the Seahawks winning by double digits. Although anything is possible I think most pundits and fans alike have discounted the Broncos defense, especially over their last 4 games. I mean giving up an average of only 15 points per game isn’t too shabby. Just hope it’s a good one and that the refs call a fair game. Good luck with your ‘Hawks Jef! LOL my ‘Hawks. We’ll see but all have just talked Manning not realizing the historical fact that great defenses best great offenses. Yeah, not sure if the Broncos got their butts kicked because they didn’t play well on both sides of the ball or because the Seahawks relentless defense was playing on a whole other level. In either case it was one of the most boring Super Bowls in quite a few years. Props to you Jef. Disappointing performance by Denver for me…Never saw this turning into such a lopsided affair. Another thing hardly mentioned is the fact that the Seahawks, for the season have given up less than 100 TOTAL yards on punt returns! More that’s a special team. Very…folks are overlooking too many facts and points. After the single-digit temps we’ve had the past few weeks, today near the Meadowlands feels balmy by comparison. Pretty much ideal weather. Yeah, we should get full dimension football today. who do you have in the game?